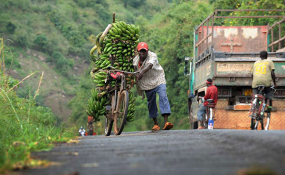 A Burundian banana farmer transports his produce to the market. Burundi stopped food exports to Rwanda in 2018. Increasing political tension between Rwanda and Burundi, which started in 2015 when political unease in Bujumbura saw its citizens cross over to Kigali, has disrupted cross-border trade between the two countries leaving traders counting their losses. This past week, 25 Burundians crossed the border to Rwanda seeking asylum. Rwanda hosts 69,089 Burundian refugees according to UNHCR figures as of November 30, 2018. Experts say that the East African Community stands to suffer as a result of escalating tensions between the two neighbours. "The EAC bloc has to act fast in order to prevent this escalation between two neighbours delaying implementation of regional projects that are meant for the good of all member states," Ismael Buchanan, a professor of International Relations at the University of Rwanda told The EastAfrican. With no hope in sight that the political tensions between the two countries will ease, most traders have rerouted their business to other neighbouring countries while a few are exploiting porous borders to smuggle goods into Burundi. Most recently, Rwanda's top RnB artiste Ngabo Medard Jobert, known by the stage name Meddy, cancelled his show in Burundi at the last minute citing security concerns. Joseph Habimana, a seasoned cross-border trader, had been transporting fruit from Rwanda to markets in Bujumbura and to border communities in Burundi. In August 2016, he and other traders were informed that they were no longer welcome to enter Burundi. Mr Habimana has since struggled to make as much money as he did when trade between the two neighbours flourished. "It has become a daily struggle for traders, especially those of us who sell agricultural products. Taking care of my family means I now have to work double to provide for my wife and children," the father of four said. "My hope is to see both countries making amends and reopening business and trade. The effects are not felt by just traders but also by the communities at the border, which heavily relied on each other for products." Another trader, who preferred anonymity, said he and several others resorted to using porous borders to smuggle goods into Burundi. Early last year, Burundi stopped food exports to Rwanda and closed down bus companies operating between the two countries, accusing them of being infiltrated by armed groups who wanted to destabilise the country. Volcano Express, a bus service that operated between the two countries, had to close its Burundi operations. Some of its employees were arrested early last year on suspicion of being spies. Rwanda says that Burundi's actions to block movement of goods and passenger buses across the border are in violation of the EAC Common Market Protocol. Burundi President Pierre Nkurunziza said recently that the Rwandan government was considered an enemy of his country. President Nkurunziza won a controversial third term in office in 2015.